Splendid Toadfish (Sanopus splendidus) | Better Know a Fish! 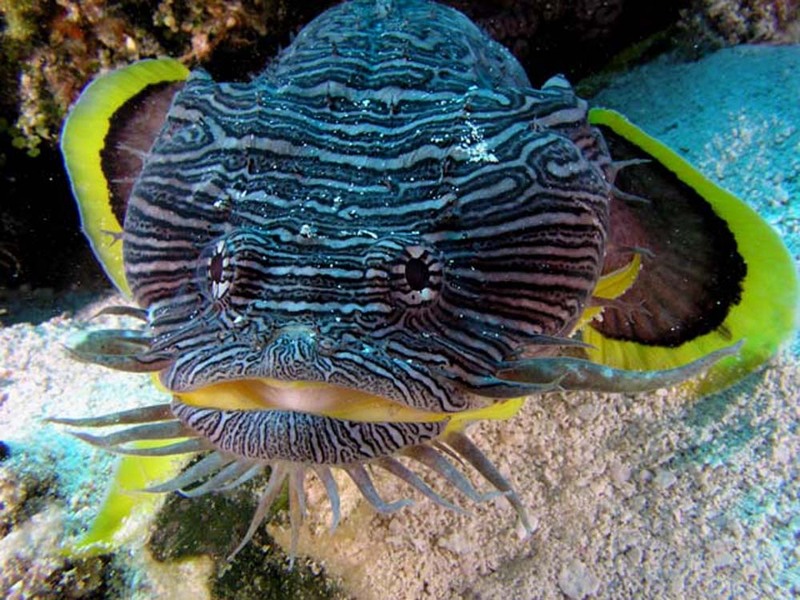 Behold, the splendid toadfish (Sanopus splendidus) — a fish that would not seem out of place wandering about Sesame Street, ready to exult the letter of the day with Cookie Monster. T is for toadfish, perhaps? Toadfishes belong to Family Batrachoididae, a group of bottom-living, predatory species found along the coastline of the Americas, Africa, Europe, southern Asia and Australia, with a few freshwater species found in rivers. They have a large, broad head and wide mouth, much like their amphibian namesakes. Whether dazzlingly striped or conservatively camouflaged, toadfishes are fascinating animals. For one, unlike most humans, toadfishes have gone into space orbit on two NASA Space Shuttle missions — including one with astronaut John Glenn — as part of experiments studying how creatures maintain balance and equilibrium in low gravity. Toadfishes also exhibit parental care. Sticky eggs are laid along a cave surface or some other solid substrate, and the nests are guarded by males. The hatched larvae remain in the nest until they absorb their yolk sacs, and are ready to crawl away to find their own hiding cave. Their secretive behavior and breeding strategy has some interesting implications. It is difficult for toadfishes to swim across great distances (Greenfield et al. 2008), so populations of toadfish can become easily isolated by geography and potentially evolve into new species. 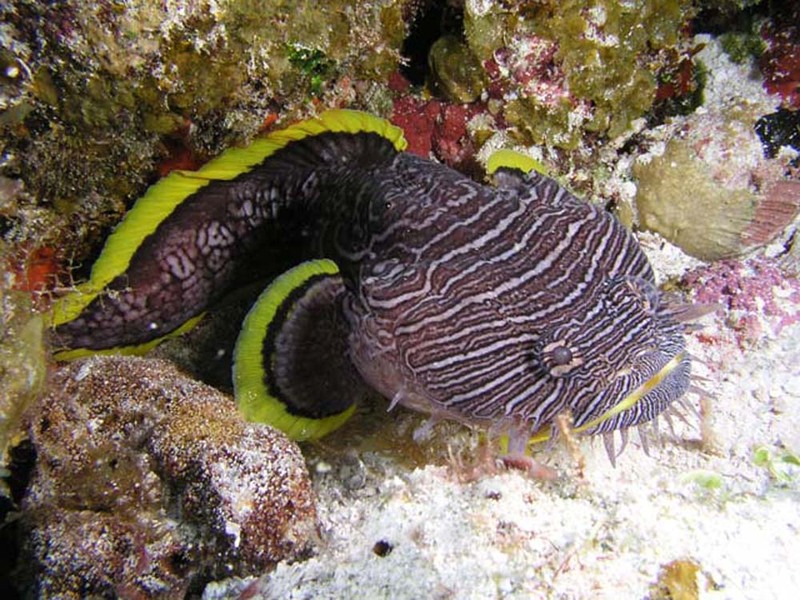 For example, our splendid toadfish can only be found in one place in the world: the popular vacation destination of Cozumel, an island in the tropical, Atlantic state of Quintana Roo, Mexico. This next toadfish got luckier — it got to snack on an invasive lionfish! Quite amazingly for such an exuberantly colored fish, the splendid toadfish was not recorded by science until 1974, when Bruce Collette, a longtime zoologist with NOAA and the Smithsonian National Museum of Natural History, helped describe the splendid toadfish as a new species. 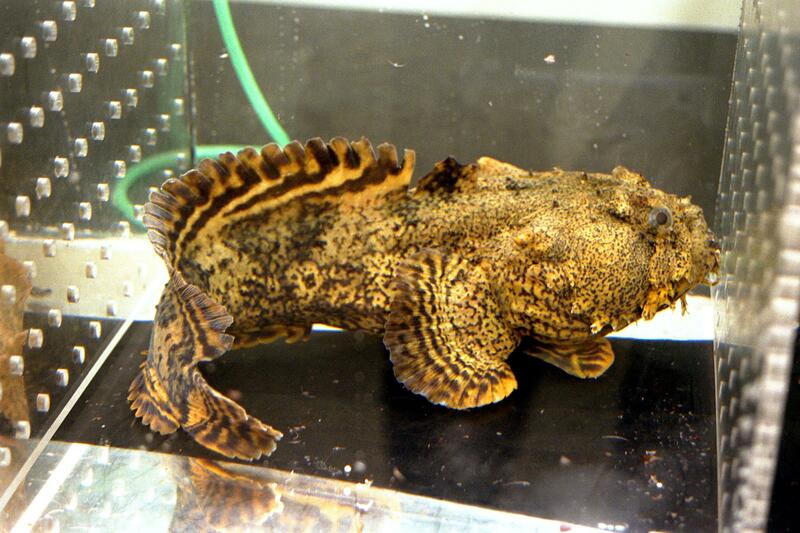 The splendid toadfish is just one of many fascinating toadfish species. Some have photophores — light-emitting spots that glow in the dark — while others generate buzzing mating calls that can even be heard by humans. What other splendid species remain undiscovered? What was it like seeing the coloration of this species for the first time — what made you describe it as “splendidus“? This species was independently discovered by the other the two other authors of the species, Craig Phillips and Walter Starck, who would not talk with each other. Separately, I had received specimens of another species, Sanopus barbatus, so I persuaded the other two authors to participate in a joint paper describing Sanopus barbatus by the three of us and S. johnsoni by Starck and me. I can’t remember which of us proposed the name splendidus, but it seemed appropriate then and now. Forty years after its description, what are some fascinating things we’ve learned about the splendid toadfish? And what aspects of its biology do we still not know? I wonder why its distribution seems to be limited to Cozumel, but even stranger is the fact that no other specimens of S. johnsoni have been collected. Toadfishes are one of your areas of expertise. What drew you to study this fascinating group of fishes? My first experience with toadfishes was with a little venomous species that we collected on board the fishery vessel Oregon in the Gulf of Panama many years ago. I originally thought it might be a stargazer but found it was the first record of a species of Thalassophryne since it was originally described. This led to a revision of the subfamily Thalassophryninae which sort of made me an expert on toadfishes with several subsequent papers as noted in Greenfield et al. Thank you for your time, Bruce. Interview edited for punctuation and formatting and enhanced with links. And for herpetology enthusiasts out there, head over to the Anole Annals website to read this fascinating account on Collette’s academic beginnings studying Anolis lizards in Cuba in the 1950’s. Collette, BB. 1974. A review of the coral toadfishes of the genus Sanopus with descriptions of two new species from Cozumel Island, Mexico. Proceedings of the Biological Society of Washington 87(18): 185-204. Greenfield, DW, R Winterbottom, BB Collette. 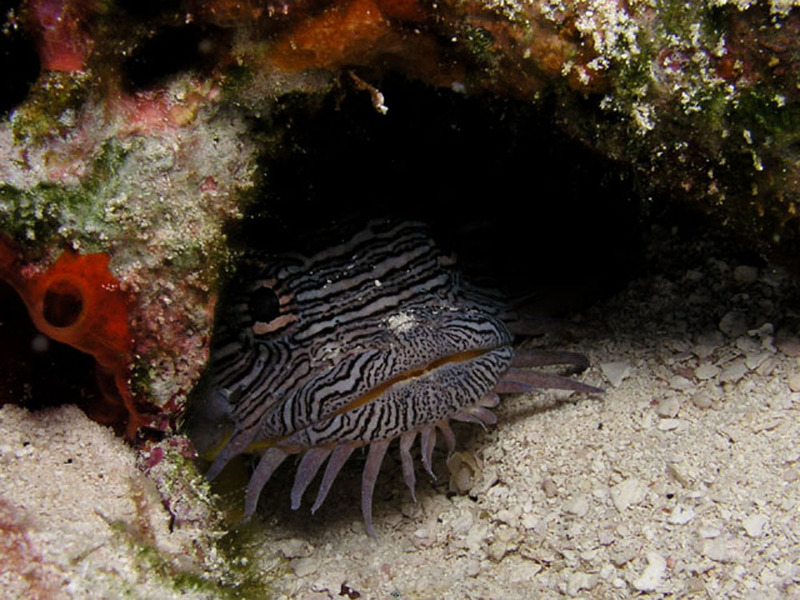 2008. Review of the toadfish genera (Teleostei: Batrachoididae). Proceedings of the California Academy of Sciences Series 4 59(15): 665-710. Many thanks to Dr. Bruce Collette for providing his time and insights. 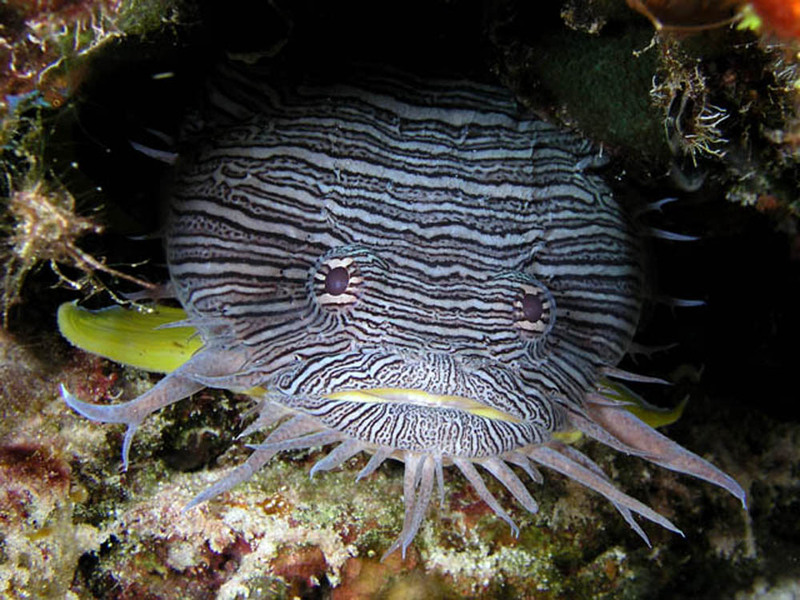 All of the splendid photos of splendid toadfish featured in this post are taken by Jim Lyle, retired professor of chemistry at California State University, Dominguez Hills. Professor Lyle took these photos during his past travels scuba diving in Cozumel, and I am grateful for his permission to reuse the photos. Take a look through his diving albums here. And thanks to doctoral researcher Natalie Sopinka at University of British Columbia for suggesting toadfishes as species to feature on Better Know a Fish. This entry was posted in Actinopterygii, Batrachoidiformes, Marine Fish, Researcher Interviews and tagged Atlantic Ocean, Batrachoididae, Batrachoidiformes, coral toadfish, parental care, Sanopus, Sanopus splendidus, sapo magnifico, splendid toadfish, toadfish, toadfishes. Bookmark the permalink.